The Chrome browser displays the page title when Chrome users turn over tabs in the desktop version of the browser. Although the information is sufficient at times, it can cause problems if sites use similar or identical page titles. Recently, Google introduced a new experimental feature in Chrome Canary and Chrome Developer that is changing this. The function adds the URL – more precisely a part of it – to the swing card. Note: The feature is experimental. 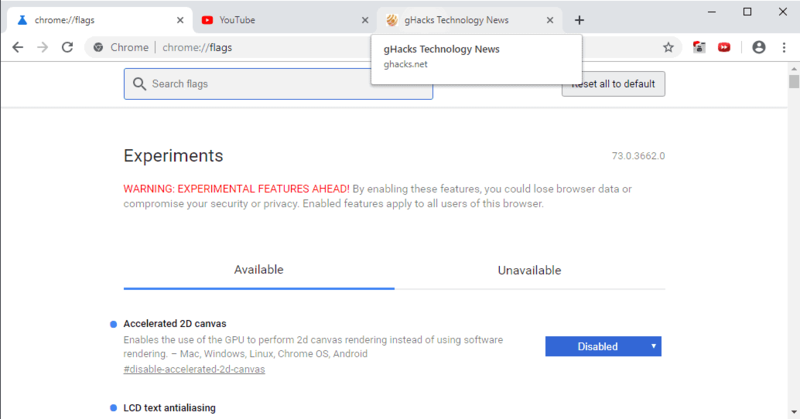 There is a chance that it will be implemented native to Google Chrome at some point, and a chance Google will remove it again without giving any explanation or alternative. The function is called Tab Hover Cards. It is only available in Chrome Canary and Chrome Developer at this time. Load chrome: // flag / # tab hover card in the address bar of the browser. Change the status of the experiment to Enabled. Start your browser for Google Chrome. The host name appears when you turn over tabs after restart. You can undo the change at any time by specifying that the experiment is disabled or default on the page mentioned above. Browsers display different information when users turn on open tabs in the browser. Microsoft Edge displays a thumbnail of the content, but no page title or URL, Firefox, Chrome and Opera only the page title, and Vivaldi a preview of the thumbnail and page title. Adding the host name can be useful in certain situations, for example, when it is not immediately clear on which site a particular page is hosted. The double line that appears as a card on hooves takes up more space on the other side. Users who move the mouse over the tab can regularly dislike as it may cover any part of the website. Chrome users running the Canary or Developer versions of the browser can try this now. Now you : What information will you see when you turn over tabs? Google introduced a new experimental feature in Chrome Canary and Chrome Developer recently showing page title and domain on hover.